An MBA has always been a sought-after qualification among managers. It has been hailed as a competency builder on one hand and hacked as a money spinner for mushrooming institutions. I read with interest the constructively critical insights by Dr. Rakesh Khurana on elite Harvard MBA. It reminded me of Henry Mintzberg, the veteran management thinker who was also critical about the typical MBAs on offer. On the local front, we had the inauguration of the MBA 2017 batch of PIM with 320 managers, the largest intake ever. All these prompted me to discuss the rigour, relevance and results in relation to a sound MBA program. Today’s column attempts to shed light on these. ‘From Higher Aims to Higher Hands’ is the title of the treatise of Dr. Rakesh Khurana. He shows that university-based business schools were founded to train a professional class of managers in the mould of doctors and lawyers but have effectively retreated from that goal, leaving a gaping moral hole at the centre of business education and perhaps in management itself. He clearly calls for reforms in management education. His criticism of Harvard MBA as a “unipolar” MBA as opposed to being a “multi-polar” MBA is worth reflecting. According to Khurana, a “unipolar” MBA trains managers to have lucrative carriers in multinationals and large conglomerates. Instead a “multi-polar” MBA should prepare the candidates in becoming entrepreneurs, setting up SMEs in fostering innovation and partnerships in offering best-cost solutions. It gave me a sense of satisfaction, as the MBA we offer has the scenario of making entrepreneurs of one out of five of its recipients. In fact, we want to double this ratio through the initiatives of the Business Incubation Centre. “Management is a practice. And you learn management by practicing management. Experience is critically important. You don’t become a manager in a classroom and you certainly don’t become a leader in a classroom. Leadership is earned on the basis of people who choose to follow you. It’s not granted or anointed by some holy water granted in a school.” These are the very words of Henry Mintzberg, Professor of Management, at the Desautels Faculty of Management of McGill University in Montreal, Quebec, Canada. As observed by Harry Costin, “Mintzberg provides a useful distinction between business and management. He argues that MBAs teach the fundamentals of business functions, not the practice of management. What is lost in the discussion is that M.B.A. literally means master of business administration, and therefore, even following Mintzberg’s argument, the degree does not disguise what it is really about. In essence, the term MBA itself is viewed as a misnomer. There is a wave of criticism on MBAs around the world. Especially after the global credit crunch and the collapse of giants led by MBAs, this negativity has gathered momentum. I myself have heard from CEOs lamenting that some of their MBAs know a lot of theory but sadly lack the practical approach in applying them into real issues. According to Forbes magazine, Business schools have always juggled two missions: educating practitioners and creating knowledge through research. Fifty years ago, as explained in the 2005 HBR article ‘How Business Schools Lost Their Way,’ business schools shifted their focus from the former to the latter. Management became a science rather than a profession. This shift had profound implications. Business schools rewarded professors for publishing their research in academic journals, and their curriculum began to reflect the narrow focus of the faculty. Business school professors became increasingly disconnected from practicing managers and leaders. By the mid-2000s, it became clear that business schools had swung too far in one direction. Ironically, we have seen a large number of MBAs move up in their career ladder in occupying leadership positions. I see the issue is not with WHAT MBA is but more of HOW MBA should be. I presume it is with this spirit, late Prof, Uditha Liyanage, former Director of PIMA stated, “do not DO an MBA but Be an MBA”. We have gone one step beyond in requesting the MBA aspirants to “be brilliant as an MBA”. There was a time in Sri Lanka where managers, when facing interviews were asked whether they have an MBA. Now the key decision makers are smart enough to ask instead from WHERE they have got their MBA. Amidst a proliferation of a multitude of MBAs, still the authentic products have a high demand. LAUGHFS Holdings Chairman W.K.H. 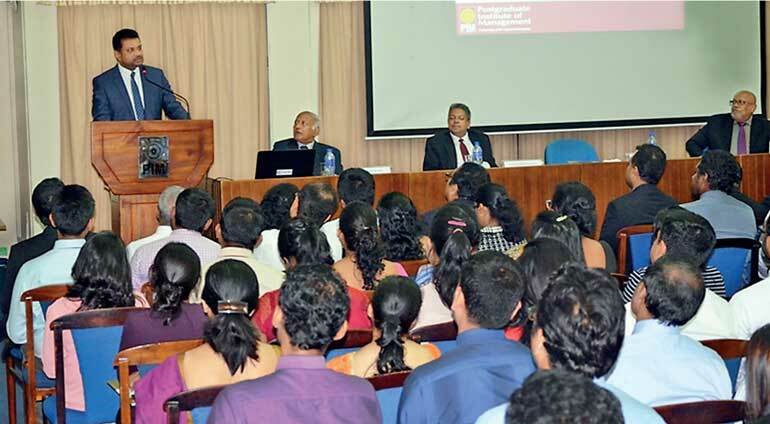 Wegapitiya recalled his transformation through the PIM MBA. He shared how he gained confidence and competence in handling complex business matters thanks to the MBA experience. He in fact challenged the aspiring MBAs to be thorough with analytical skills on one side and innovative ideas on the other side. It was PIM Senior Consultant Dr. Travis Perera who shared his thoughts on the dual aspects of MBAs. They are, in a way, consumers of PIM, receiving the education from us. At the same time they are co-producers of knowledge and skills. Hence the term borrowed from the marketing echelons, Prosumer, aptly demonstrates their nature. PIM’s MBA inauguration last week prompted me to move down the memory lane. I indeed went through that transformational experience. As I started off as an engineer and then switched over to management, I realised that MBA would train the learner with a holistic view of a situation. In brief, the learner will be able to enhance the functional knowledge through a cylindrical view to broad business knowledge through a conical view. This “interconnectedness” transforms the learner to appreciate other functions with a broader prospective or holistic view of the business. Equally as the educational thresholds are ever going up, the Accreditation system and Quality assurance are of paramount importance in offering a standard MBA. I tend to think that the success of an MBA programme reflects essentially on its alumni. It gives me pride in stating that PIM being the pioneering MBA offering institution in Sri Lanka, has so far produced over 200 CEOs. It highlights the value of MBA with its quality and relevance, locally as well as globally. I would like to quote the famous author Aldous Huxley here: “At the end of the day what matters is not how much you know but how much you have done.” Simply, the MBA should not be limited to a paper qualification. The purpose of the MBA is to produce professionals not theoreticians. Being brilliant as an MBA will bring out professionals who will possess a holistic view of a situation and hence will innovate new ways of thinking through the ability to think on feet and apply knowledge more systematically. An MBA will always bring new ways of doing things to the table and deliver results for long-term sustainability of an organisation. Thus, MBA is essentially employability and what is best, professionalism. MBAs should never be Mentally Below Average. It should always be Mind Before Action. It reminds me of what Asian wisdom has taught us, the Seeing-Doing nexus. “Samma Ditti” (Right seeing) should lead to “Samma Vayama” (Right action). A good MBA helps the learner to see things clearly and do things cleverly. That’s what we require in a turbulent world with chaotic competition all over.